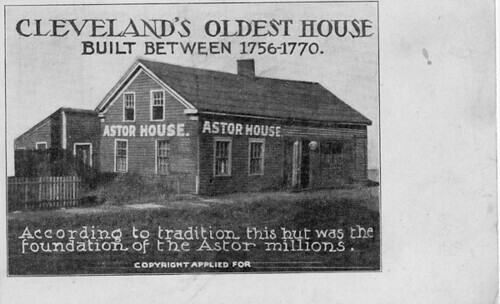 On Monday, I introduced the Astor House, said to be the oldest house in Cleveland at the time. This was followed by two articles from the Annals of the Early Settlers Association, the primary source for just about all of the articles on the structure that followed. Today, I'll illustrate what we can say with certainty about this lost piece of Cleveland history. The Annals article suggests that the house, built as an office for the Northwestern Fur Company, might be as much as 200 years old. The article was written in 1883, so this would mean that it was built 1683 - highly improbable at best - and certainly not the case if it was built for the North West Company, which was founded in about 1770. If we're to presume that it was built by the Company, it must have been built after that date. The article notes how the house was moved several times over the following years. The resouces for me to document this simply aren't present. We can be sure that it was on the corner of Hanover (West 27th) and Vermont Streets in 1883, but there's no good way to trace where it might have been before that date. The article provides few details about the physical structure. There were eleven courses of shingles on the roof, one on top of the other; the under shingles were the long ones, which looked more like barrel staves, while those on top were more modern and smaller... then I took the old siding off and put on new, as it was quite an eyesore to the community in its original shape... every stick in the house, even to the siding and long shingles, was hewn out with a broad ax. The house was made entirely of chestnut, as that wood is easily hewn... The shingles and siding are about all that there is of the house as it now stands that was not in the original warehouse. When I took it down to move it, I found it full of hairs from the bottom to top and between the floor of the upper story and the ceiling of the lower was entirely filled up with hair. Annals of the Early Settlers Association, Number 4 (1883), pages 49-52. The upright supports were of very heavy timber, perhaps six inches wide by four inches thick and morticed together at the edges, but there were no logs. The style and construction methods of this structure are consistent with something built no later than the 1830s. After that date, the timbers used for the frame would not have been so robust. Also, it has a central chimney, which became much less common after that date, in favor of smaller ones on the ends of the structure. Further, since it was already considered an old house in the 1840s, we can reasonably assume that it was built earlier. The presence of fur in the interior crevices might suggest that the structure was, in fact, used for the storage of furs. The two front doors are consistent with a structure used for commerce - they would enable better traffic flow. Cleveland Plain Dealer October 23, 1898, page 18. The articles note that the exterior remained relatively unchanged. The style is consistent with something that could have been built in the 1780s, or even earlier. 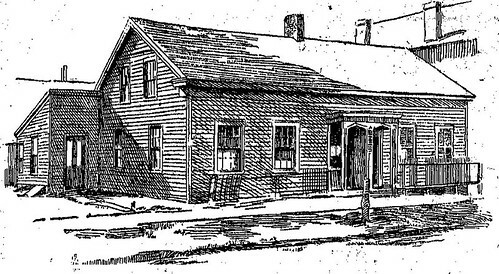 Could this house have been built in the 1780s, before Moses Cleaveland visited the site that would become Cleveland? Yes. Will we ever know for sure? Probably not. There simply isn't enough data remaining. What we can say is that, at the time of the demolition, this was almost certainly the oldest house in the city, most likely built no later than 1810. It could have provided real insights into the early settlement of this area. The History of the "Oldest House in Cleveland"
The Oldest House in Cleveland?